These are two pieces from a new ambient campaign to promote Trekinetic, a company that produces special all-terrain wheelchairs by the design agency Ogilvy London. Ogilvy where given an extremely limited budget and had a very small and precise niche market which meant that more traditional forms of advertising such as press and TV where ruled out. 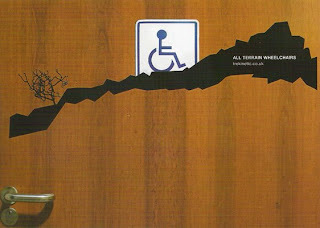 As a result them came up with a fantastic campaign that involved sticking off-road scene silhouettes over disabled toilet door signs (a place they knew that they where targeting their niche market) so that it looks like the wheelchair is going off road. This is then baked up with the Trekinetic name and website address. 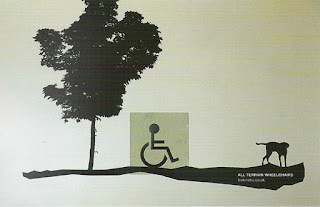 This shows that no matter how limited your budget with a creative imagination you can create a very effective solution.